Bacteria strain Shewanella ANA-3 incubated with arsenate and thiosulfate produces a yellow As2S3 precipitate. The nanofibers produced in this way can be incorporated into FETs. Courtesy of Ian McFarlane and Mohamed El-Naggar, University of Southern California. Bacteria could provide a greener means of synthesizing nanoscale inorganic materials for electronic devices quickly, efficiently, and sustainably. 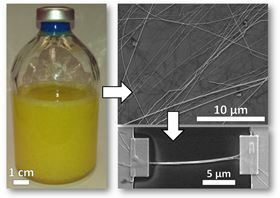 Researchers from the University of Southern California have used a strain of Shewanella bacteria to produce As2S3 nanofibers, from which field-effect transistors (FETs) can be assembled [McFarlane, I. R., et al., Acta Biomaterialia (2014), doi: http://dx.doi.org/10.1016/j.actbio.2014.11.005]. The Shewanella species of bacteria reduces arsenate and thiosulfate to the chalcogenide, As2S3. Chalcogenides are remarkably versatile compounds that can be crystalline, glassy, metallic, semiconducting, or ionic conductors, depending on the composition and synthesis. Here, the As2S3 produced by Mohamed Y. El-Naggar and his team using the ANA-3 Shewanella strain is in the form of amorphous, semiconducting nanofibers 20-600 nm in diameter and up to 150 µm in length. Bacteria are simply incubated with arsenate and thiosulfate at 30°C for around 16 hours, after which bright yellow As2S3 precipitate forms outside the cells. The nanofibers can be deposited onto oxidized Si chips with photolithographically pre-patterned Au contacts. Pt source/drain electrodes are then added using focused ion beam deposition to form FETs. Some of the devices display characteristics indicative of p-type nanofibers, while others suggest n-type behavior. The more complex behavior of some devices is likely to be the result of bundles of heterogeneous nanofibers. The biological or biomimetic synthesis of nanomaterials has many potential advantages over traditional means that typically require harsh conditions such as high temperature, pressure, and pH. By contrast, bacteria can produce inorganic materials under ambient conditions. The approach could be quite practical and versatile, say the researchers. El-Naggar suggests that it could be used to treat groundwater, where As can be a major contaminant, and produce nanomaterials in the process. The team is currently working to expand the range of chalcogenides produced to include selenides and tellurides. The main obstacle to overcome, however, is the heterogeneity of the fiber dimensions, which the researchers do not yet know how to control.